Vladimir Semyonovich Vysotsky (January 25, 1938 – July 25, 1980) was an iconic Soviet-Russian singer, songwriter, poet, and actor. He was a Jewish and Russian. His career had an large and lasting effect on Russian culture. 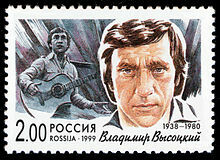 Vladimir Vysotsky had many talents and is often described by the word "bard" (бард). This word had a special meaning in the Soviet Union. Vysotsky was never happy about this. He thought of himself as an actor and writer. His work was largely ignored by the official Soviet cultural establishment. He had remarkable fame during his lifetime. Today, many of Russia's popular musicians and actors try to be like him. Vysotsky died in Moscow, aged 42. Wikimedia Commons has media related to Vladimir Vysotsky. This page was last changed on 22 April 2015, at 08:06.